Hello my beauties! Hope all is doing well. Last week I shared with you guys the things I think are ESSENTIAL to plan a head when planning for a vacation (click here to check) and thats when I realised that there is a lot of thought process that has to go into planning the most brilliant vacation ever! Therefore I thought that today I would share with you what I would personally look for when booking a hotel and maybe this could help you decide on a better hotel the next time you go on holidays! These are all the key things my boyfriend and I look for in a hotel when we go on the hunt for a good one to spend our days off or vacations at! Try your best to find a hotel that is located around a beach or some attractions therefore saving you some money on commuting and etc. If there is one thing I have really started loving, is being able to work anywhere and at whatever time! However to accomplish that I need my laptop, my notebook and a strong connection to wifi, and there is nothing better than free wifi... Therefore, having wifi connection at a hotel room is KEY! If you're driving on your vacay, you're going to need somewhere to leave your car where you will feel like it is safe to stay throughout the night. I wouldn't recommend parking anywhere if you do not know where you are or the area properly. Therefore, having a parking lot is very much a neccesity. I am not sure if all hotel's charge for parking but I know that some do, and it can be bliming expensive if you ask me but its the safer option so always go for it! There's nothing nicer than waking up and knowing you can go straight to the swimming pool for a morning swim. If you're hotel is not located by the beach then it can be rather nice having somewhere with water to go too on a hot day. 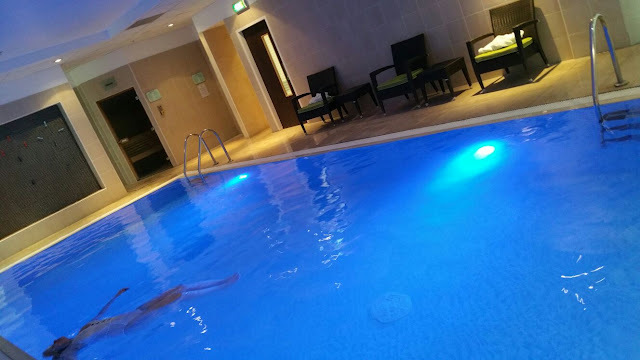 I don't know about you but I am not one to choose the gym over a swimming pool but it is always nice to have the option open for you, just incase you do decide you'd like to go for a little workout. After a good workout its always nice to relax yourself further so a spa sounds pretty awesome too! Always make sure your room is spacious enough for you and that it has a good view! Although the view isn't that important because you'll probably spend all your time outdoors, it would be nice to not have a window that just looks out onto the wall of the next building along. Make sure that the room includes a mini fridge and airconditioning! THOSE ARE ESSENTIAL! I can't emphatsise it more than that! Hope this has helped at least one of you! Have a lovely summer!